Here is one last glance at the finished hardware before it gets planted. Small touches make the system look polished from every angle, and its numerous light fixtures brighten the entire room. I really like how the backlights in particular turned out. 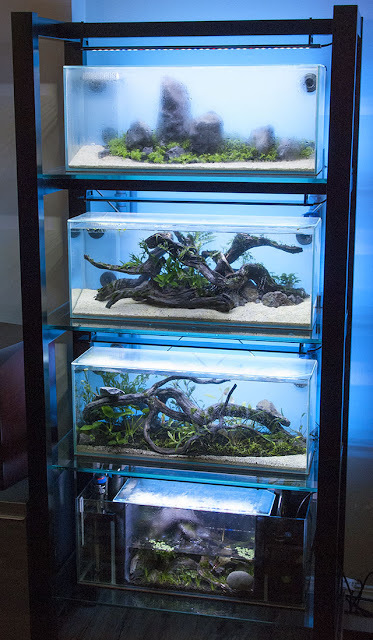 It is difficult to work on the tanks when they are installed in the bookshelf, so I disconnected each one in turn and worked on them separately. Planting a tank is easiest when done dry, with just an occasional spritz of water from a spray bottle to keep the plants moist. 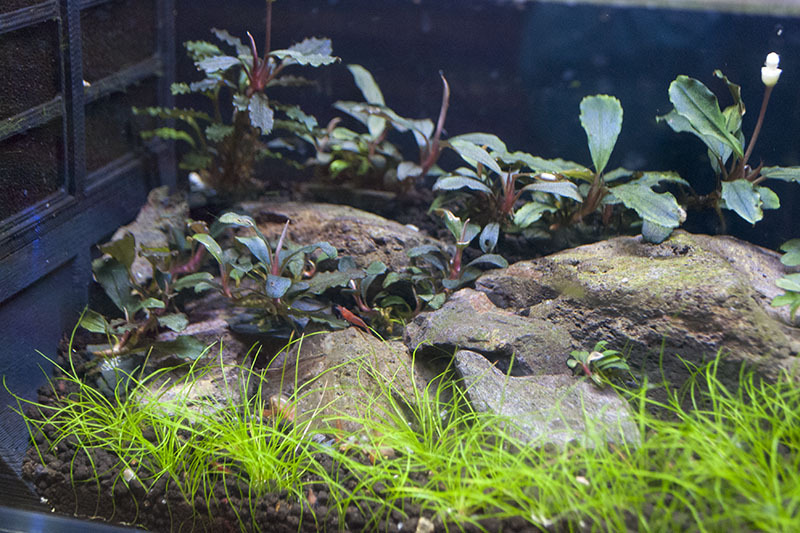 The tanks are surprisingly narrow when viewed from above. 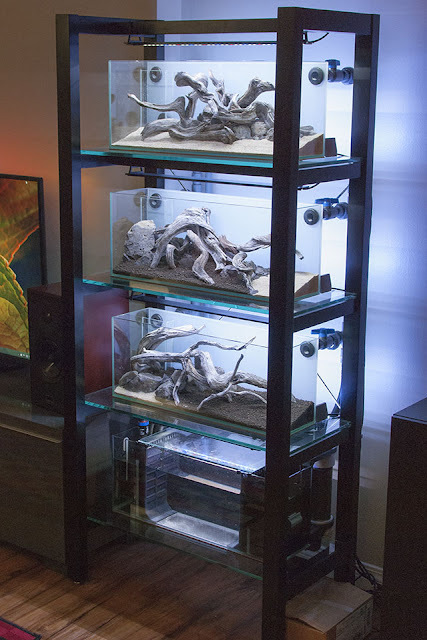 After all four tanks were planted and reinstalled, I started filling the system with water. 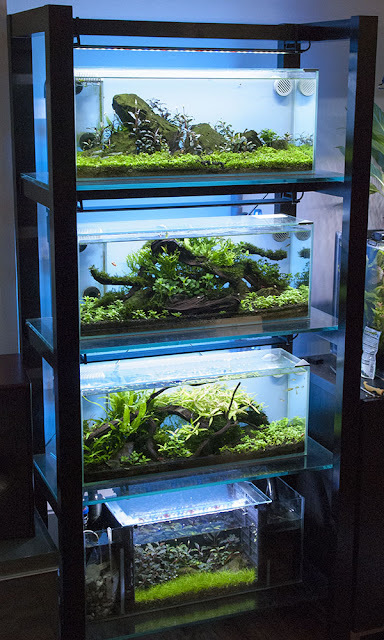 At this point it is best to let the aquariums run uninhabited for one or two weeks so that an ecosystem can establish itself. 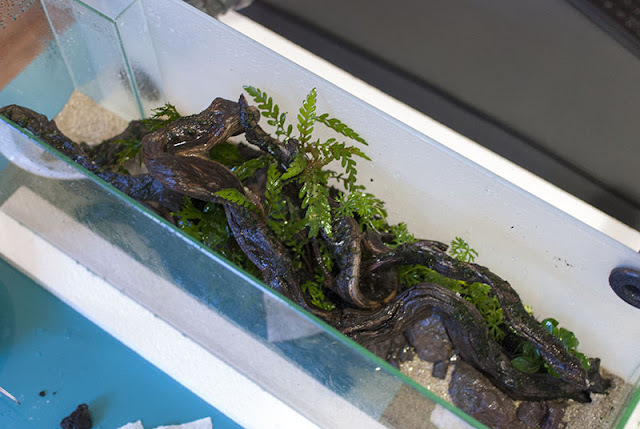 Water parameters in a new tank can be quite harsh until the plants and bacteria begin to stabilize the system. 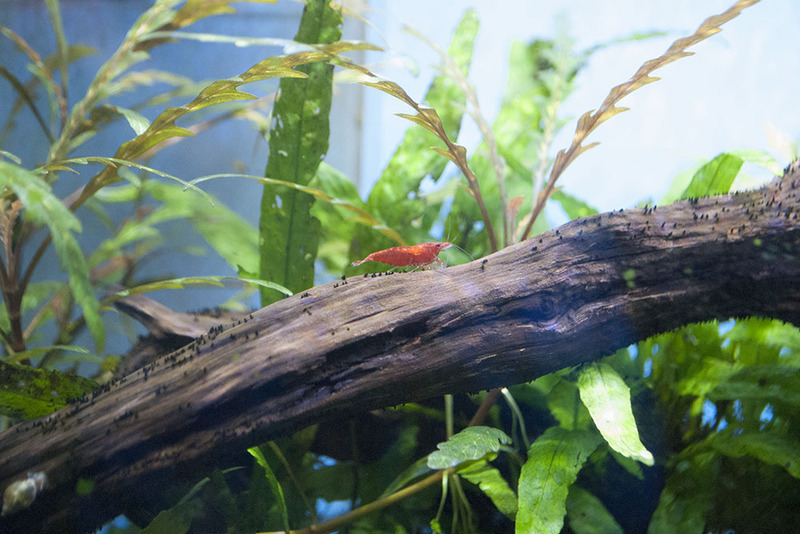 After some time I introduced some Cherry Shrimp to the aquarium. 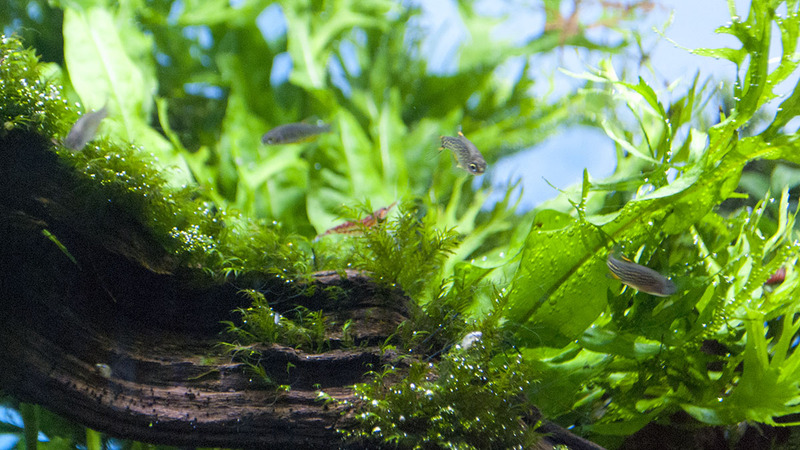 Shrimp are good first additions because they apply very little bio-load to the tank. 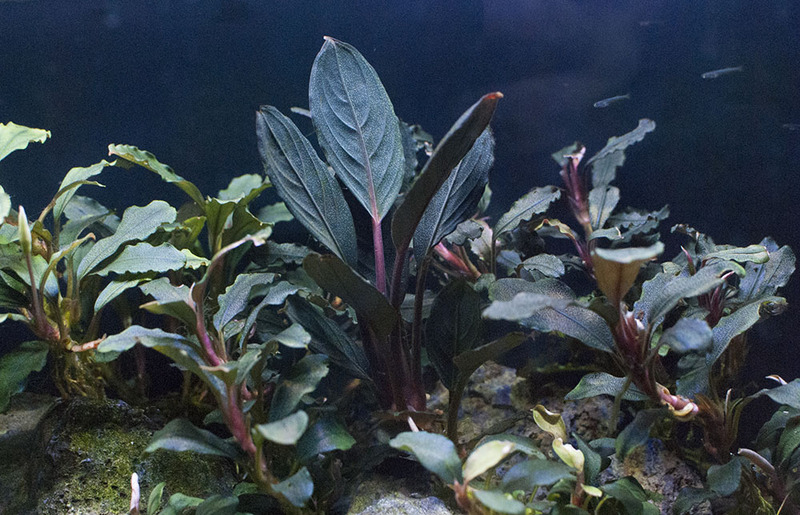 They add a bit of color, can be interesting to watch, and most importantly eat many forms of algae. An unexpected consequence of the connected aquariums is that shrimp are free to wander between tanks by swimming through the pipes. 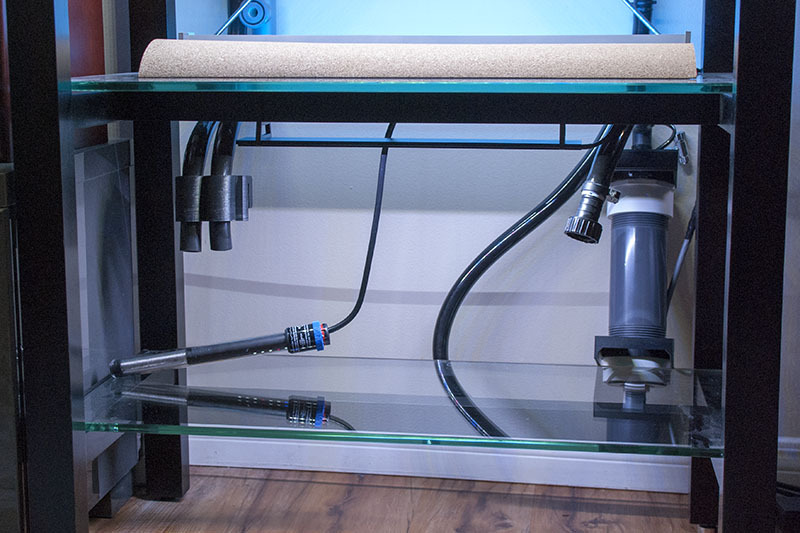 I tried to discourage this behavior by printing a finer set of gratings and bulkhead covers, in hopes that I would be able to keep different populations of shrimp in each tank. Nothing will prevent the smallest shrimp from washing into the sump, but the covers help slow movement between tanks as only large shrimp are strong enough to climb against the flow. 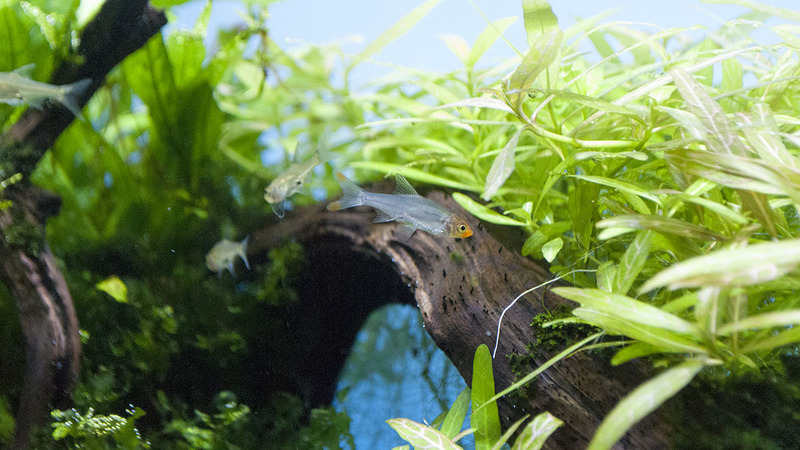 At this point the ecosystem is developed enough to support a heavier bio-load, so after the shrimp had settled in I introduced a variety of fish to my tanks. 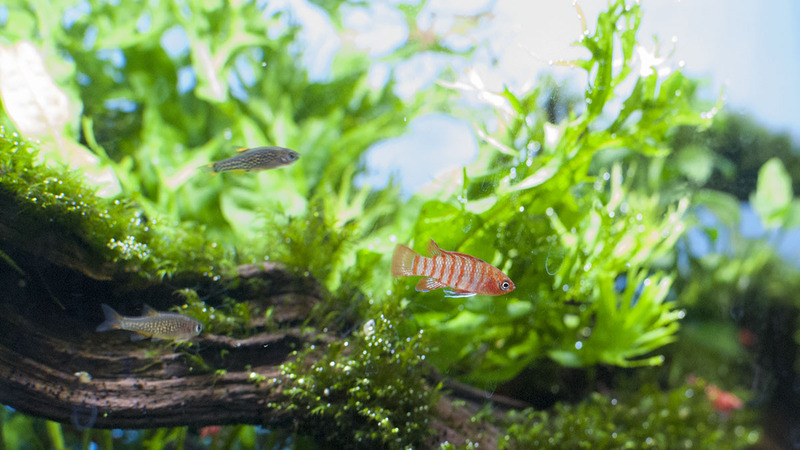 The Scarlet Badis is one of the most spectacular "nano" fish, and stays less than an inch long even when fully grown. Small fish often behave very uniformly and are averse to leaving their groups, but the Badis is surprisingly intelligent and independent. 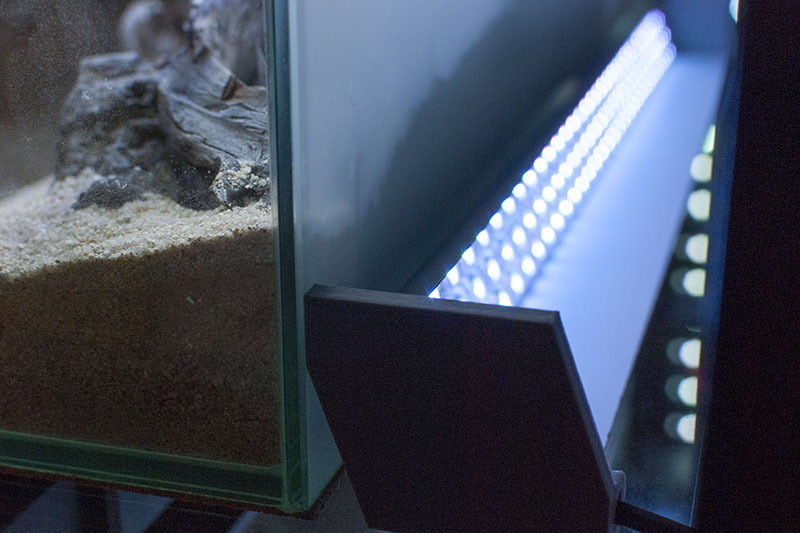 It loves to inspect its surroundings, and gets up to all kinds of interesting behavior when it runs across other inhabitants of the tank. Pacific Blue-Eyes might look plain at first sight, but their eyes and fin morphology draw attention upon further inspection. These social fish can be exhausting to watch, I've never seen anything else match the endless sparring and swimming they engage in. The Rummy-nose Rasboras loosely school and prefer to investigate and observe. 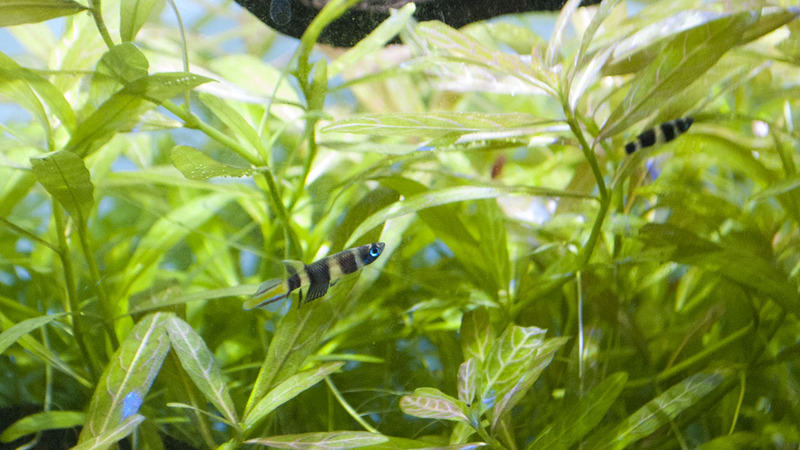 These guys are exceptionally good at hunting down and eating shrimp, which might pose a problem over time. 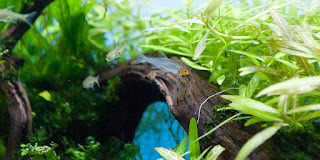 Celestial Pearl Danios have unique coloration and are some of the smallest fish available. 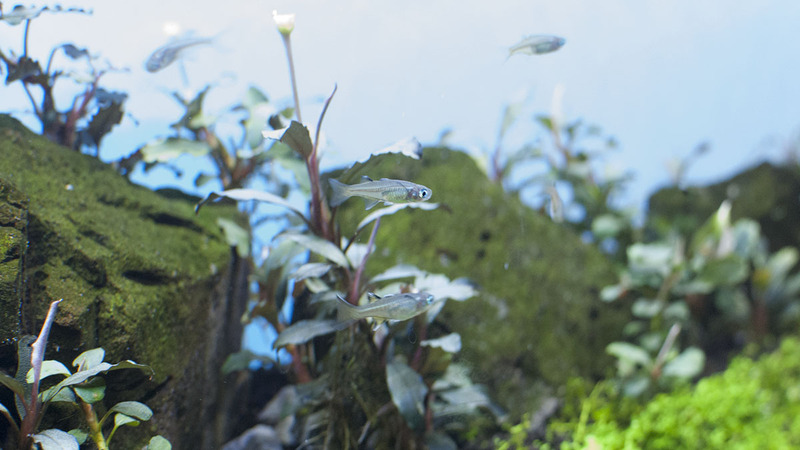 They can be quite shy even in groups so it can be helpful to pair them with more active fish. Killifish are known for their extraordinary coloration, and the Clown Killifish is no exception. They are comfortable even in very dense plant cover, and prefer to stay near the top of the tank where they are able to instantly react to food. I have quite a few different types of fish in my tanks, but each tank only houses one or two species so none of the tanks feel busy. 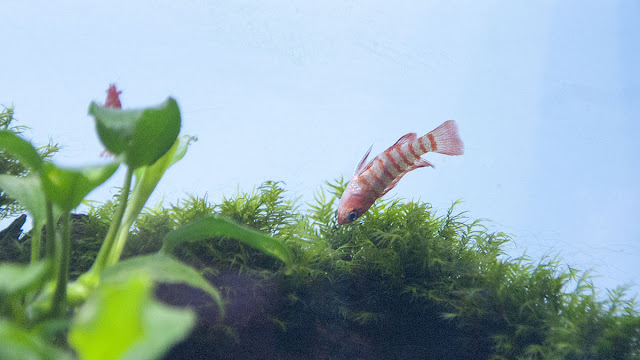 I've finally included one last picture of the Scarlet Badis, this time swimming upside down in an attempt to pick something out of the moss. I've written quite a bit about the fish in the aquariums, but the plants can be quite interesting as well. The plants in this photo are all varieties of Bucephalandra, a unique but slow growing species. There are actually four baby fish in the top right corner of this image as well. 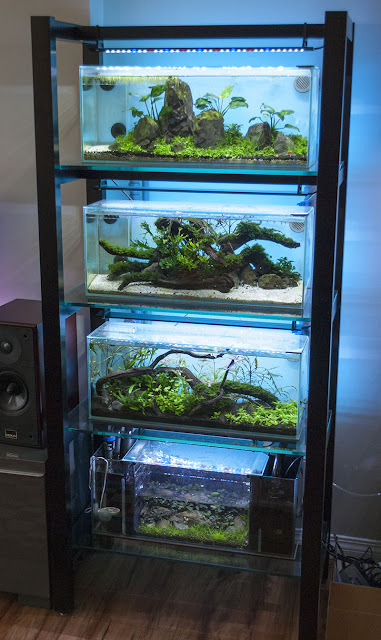 I've been using this system for several years now and am quite happy with how it turned out. 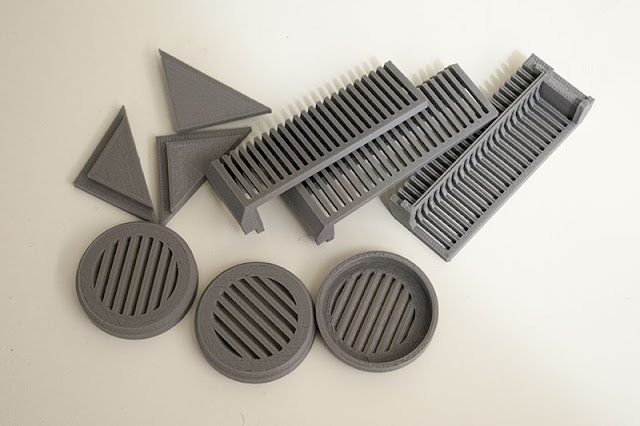 The multi-level overflow has been extremely reliable and is a great success. The aquariums can be difficult to clean as access to the tanks is cramped, but regular water changes are easier since you can drain and refill all four tanks from a single location. The finished project looks so polished that it is rarely even identified as DIY.